A few weekends back was a typical example. I was surrounded by a variety of professionals who helped me look extremely proficient and I’d like to take this opportunity to thank them, their companies and their teams for absolute support and productive hard work. When visiting The Hilton Arts Festival last year, I spotted a gap for fine-dining food and I knew Jackie Cameron School of Food & Wine had to participate in the 2015 event. I was overwhelmed with the encouragement we received from patrons of the festival and from other stand holders. Now that I have a better idea regarding requirements, I look forward to September 2016. Planning started with a conversation with the team at Culinary Equipment in Lanseria and led to a state-of-the-art Lacanche mobile unit being loaned to us. Wow… If you didn’t see this baby I suggest you pop into the showroom when you’re next in Joburg. It’s just around the corner Lanseria Airport - so you could fly there! This is kitchen paradise. Su Huggett, The Hilton Arts Festival general manager, suggested we offered tea at our stand – and she was right. Thank you for your professional insight Su. The teas that immediately sprung to mind were those of Bryn Thomas and Ieva Tomase of The Tea Chest in Cape Town, sole provider of TWG in the country. There was a celebration in every cup. I was astonished by the number of folk who were converted to the point of buying boxes of this tea to take home. It was rewarding to witness people open to change and to new experiences. Also, I think our tea pairing with a tantalising slice of cake almost forced people to take the leap. Each of my students had chosen a cake recipe and together we worked on the pairing. To suit the occasion, Kerry, of Kerry's Flowers and Decor cc, provided elegant teacups, cake stands and domes, all of which created an interesting talking point – and enhanced the sophisticated mood we’d created for our stand. The versatile Bedouin-styled cover from Midlands Stretch Tents topped our entire setup. We’ll need a larger tent next year, Kelly Shaw. Our guests were pretty insistent on this! Top sellers for our tea-and-cake pairings were the chocolate-and-peppermint cake that we paired with the TWG Choco Mint Truffle Tea and the naartjie citrus cake with vanilla-bean icing that we paired with the TWG Red of Africa Tea. Our participation at the Hilton Arts Festival would not have been possible without my mother, father, sous chef Elaine Boshoff and students of the Jackie Cameron School of Food & Wine - Cara Conway, in particular. She went that extra mile and exceeded all my expectations. must also make mention of Ben, Paula, Justin, my aunt Bee and godmother Katie who demonstrated extraordinary stamina as they consistently impressed the guests with their relaxed, hospitable manner. This was team effort at its best and I was grateful that I had the best at hand. Here’s to next year – we’ve already booked our stand. See you there. Explore my website to find out more about my WOMEN'S chef range - men's to come shortly; remember Jackie Cameron Cooks At Home and all my foodie adventures.I always look forward to hearing from you on jackie@jackiecameron.co.za. 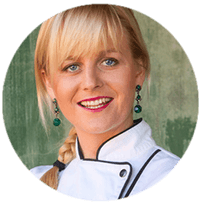 Food styling and recipe development: Elaine Boshoff. Salad Secrets for this Summer!